story and photos by Grace DickinsonWe can find an estimated 10,000 kinds of mushrooms just in North America. Of these, only 250 are edible, but still—that’s a lot of options. Diversity can be an asset to the typical cook and eater, but what makes the mushroom a staple in the locavore kitchen is its adaptability to be grown outside and inside. Mushrooms are essentially available year-round, making them a popular local ingredient, even in the last few weeks of winter. This is especially true for Philadelphia, which is located less than an hour from Kennett Square, the “mushroom capital of the world.” Kennett Square farmers grow 65 percent of the mushrooms eaten in the U.S., and the area is home to large farms like Phillips (see p. 11)—the first successful indoor shiitake grower in the country. One of Phillips’ best sellers is oyster mushrooms, which are sold by large supermarket chains like Wegman’s and Giant as well as local vendors who redistribute to Philadelphia restaurants. Though easy to buy locally, mushrooms can be grown at home too. Local gardener Anna Herman suggests starting with the popular, but unique, oyster mushroom. For Washington Square’s vegan restaurant Vedge, mushrooms play an important role in the all-vegetable menu. “Mushrooms are our go-to, kind of a trailblazer against meat and potatoes,” says Richard Landau, co-owner and executive chef, alongside his wife Kate Jacoby. “Psychologically, people envision vegetables on the side of something. Mushrooms are a really great way to transition from that because they are meaty and they take on amazing flavor.” Landau, who buys all his mushrooms from a distributor based in Kennett Square, says he particularly likes oyster mushrooms for their delicate flavor. “Their greatest asset is when you get the feathery ones,” says Landau. 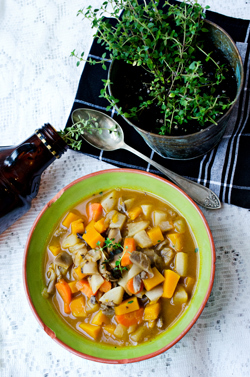 “When that happens, I think it becomes one of the greatest mushroom vectors you could possibly eat ... the way it’s so crispy and just delicately nutty and earthy at the same time.” In the following recipe, Landau chose to play off the oyster mushroom’s chewy texture in a hearty, winter stew. Expect a summery corn chowder version in the Vedge cookbook, due out in June. Heat olive oil in a large stock pot until it ripples. Add onions and garlic, and brown for 2 to 3 minutes. Add the mushrooms, salt and pepper, and brown for an additional 3 to 5 minutes. Add sherry and reduce by half. Add stock, tomato paste, porcini powder, carrots and celery root, simmer 10 minutes. Add the squash and simmer until tender—about 8 to 10 more minutes. Stir in the herbs and remove from heat. Serve immediately. 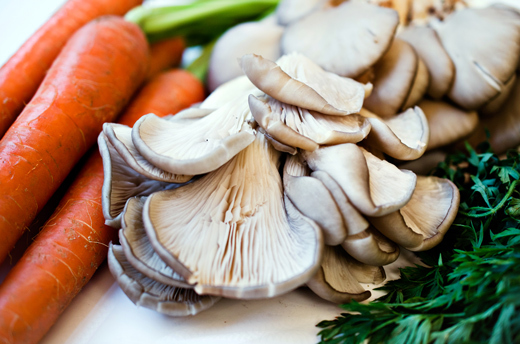 Mushrooms will keep up to a week when left unwashed and stored in a brown paper bag on the refrigerator shelf (not in the crisper!). To preserve for longer, try refrigerator pickling! Cover blanched oyster mushrooms with rice wine vinegar, black pepper, rounds of fresh ginger, and a dash of toasted sesame oil. Cut clean button mushrooms into wedges and marinate in a combination of red wine vinegar, extra virgin olive oil, crushed garlic, red chili flakes, Italian herbs and coarsely ground black pepper.